Playgroups are a good opportunity to get out of the house and meet other mums. There are playgroups on throughout the week in Wimbledon. Here is our pick of the best groups on offer. Every Thursday during term time from 9.30 to 11am. We don't charge for entry to our group and refreshments are provided. All babies, toddlers and pre-school children are welcome with their parents/carers. A parent and toddler group in Wimbledon. Lots of activities for children, including story and craft time plus refreshments. A group for dads and toddlers – age range 6 months +. �Toys & snacks for the kids; quality coffee and bacon roles for the dads; peace and quiet for mum! A parent or carer and toddler group in Wimbledon. Dads and Tots provides a venue, once a month, for Dads and pre-school kids to spend time together. It is a great opportunity for young dads to meet each other and of course to give mum a break!�There are lots of toys for children to play with whilst dads enjoy bacon sandwiches, croissant and fresh coffee.�All welcome! We run on the second Saturday of the month (normally *) from 9.30am - 11am. On Wednesdays at Everyday Church Wimbledon, our parent and toddler group gives local mums, dads and carers a chance to get together for a chat and cup of coffee while the kids expend a bit of energy! We have a wide range of toys and equipment for all pre-schoolers. Parent or carer and toddler group in Wimbledon. 9.30am to 11.15am Thursday mornings. Parent / carer and toddler group in Christ Church Hall, for under fives, refreshments avaliable. Activities / Resources include: Art & Craft, Play Dough & Colouring, Ride-On Toys, Home Corner, Train Track, Baby Play Area, Books, Jigsaws, Construction Toys, End of morning Sing-a-Long. Somos familias con ni�os de edades entre 0 y 5 a�os. Quedamos todos los viernes de 10.30am a 12pm. Animate, tenemos juegos, canciones y manualidades... solo son �2 por familia que cubre el aquiler del local, cafes, y galletas. Estamos en South Wimbledon SW19. Padres tambien bienvenidos! Somos varios pero siempre necesitamos mas. (This Parent/Carer & Toddler group - Grupo Espanol - offers an opportunity for any Spanish-speaking adults to meet while the children share experiences and play with other children. Babies and children up to 5 are welcome. Toys, activities and a singing time in Spanish are provided for the children. The adults always stay and remain responsible for the children they bring. The group runs on a voluntary basis and a parent roster operates for essential tasks. A small fee is charged to cover basic costs. Sessions entirely in Spanish).�We're on Facebook as "Hablamos Espa�ol - Spanish toddler group in Wimbledon"
Parent or carer and toddler group held at St John's Church Hall (opposite Abbey Children's Centre). A playgroup in Wimbledon, offering see-saws, a slide, jigsaws, ballpit, books and more. 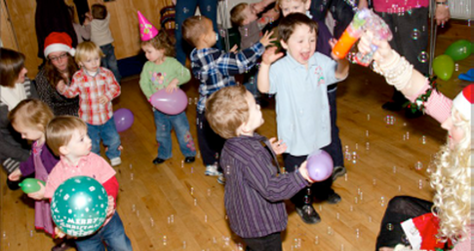 Craft activities run regularly and the sessions end with songs and bubbles. Entry fee includes tea, coffee, biscuits and healthy snacks for children.